Often the first order of business on a construction project is removing whatever structures or natural barriers exist. There’s a hydraulic attachment for that. Actually, there are multiple hydraulic attachments you could use for demolition work as well as other jobsite clean-up or compaction work. The key to efficiency—and profitability — is to choose the right tool for the job. Here are some of our favorites for different types of applications. Instead of breaker-style jabbing motion, concrete busters use cutting jaws and a biting action that makes them ideal for demolishing thick sections of concrete such as building foundations. The very wide jaw opening also makes concrete busters valuable for work where the operator’s visibility is limited. In order to remove demolished material from the jobsite, it usually must be made smaller. A hydraulic pulverizer works a moveable jaw against a fixed jaw to crush material and also to separate any iron that may be present. Bulk pulverizers typically do not need a rotator because they simply pick up material from the demo pile. That makes the machine lighter, so it can deliver more power and greater precision for digging. A demolition pulverizer, on the other hand, crushes material and removes iron as the wall is torn down. This style does typically use a hydraulic rotator to control positioning, which makes it ideal in situations where there is nowhere to pile falling debris or where care must be taken not to damage surrounding structures. It takes a different type of hydraulic attachment to demolish buildings constructed of large steel plates or girders. The steel shear works something like a scissor, with a single jaw that moves between two fixed jaws. It can also rotate. 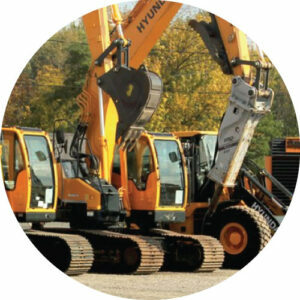 It uses two, two-way hydraulic connections and a very large hydraulic cylinder to provide maximum cutting force. This tool uses a hydraulic-powered generator to create a magnetic field on the exposed underside of its bottom plate. The magnetic field attracts and holds steel particles, then quickly demagnetizes them so they drop away again. Operators use a remote control and auxiliary hydraulic system to control the magnet. Magnets are commonly used in both recycling and demolition operations to separate steel from other materials and for loading. They are also useful to clean up roadwork projects where leftover steel would pose a hazard to vehicle tires or pedestrians. When the job calls for compaction instead of demolition, hydraulic compactors are ideal for both open areas such as railroad and roadway slopes and tight spaces such as pipeline backfills, where other equipment cannot function. Many contractors also use compactors to install and remove formworks such as piling, posts, and sheeting. Outfitted with a quick coupler, a single excavator can handle both filling and compaction. The versatile grapple has two moveable jaws. They are mounted on each end of a rigid frame but operate together, driven by two to four hydraulic cylinders. There is also a hydraulic rotator that enables more nimble material picking, sorting, and positioning. That said, grapple design differs depending on the work to be done. For example, demolition requires heft and strength, whereas sorting requires a lighter touch with quick, precise control. Grapples can also be outfitted with various accessories to increase their usefulness. Worksite productivity depends on speed and efficiency. By choosing the right hydraulic attachments, you can ensure your construction projects are not only more productive but more profitable.